Bahrain says that 'Australia’s position does not hamper the legitimate demands of the Palestinians.' Erekat slams 'irresponsible policies'. The Arab nation of Bahrain made an irregular statement of support for Australia's decision to recognize western Jerusalem as Israel's capital. Ahead of the announcement, Australia warned citizens to take care while traveling in neighboring Muslim-majority Indonesia. Scores of Australians preparing to jet off to Bali and other tropical island destinations for upcoming summer holidays should "exercise a high degree of caution", the Department of Foreign Affairs warned. However, Bahrain’s Foreign Minister Khalid bin Ahmed Al Khalifa opposed the Arab League's "irresponsible statements", tweeting that "Australia’s position does not hamper the legitimate demands of the Palestinians and first and foremost East Jerusalem as the Palestinian capital. Earlier this month, Al Khalifa blasted Hezbollah for digging terrorist tunnels from Lebanon into Israeli territory. "Is the digging if tunnels by the organization not an open threat to the stability of Lebanon? Who bears responsibility when the neighboring countries take upon themselves the task of getting rid of the danger that threatens them?" he wrote in Arabic on Twitter. 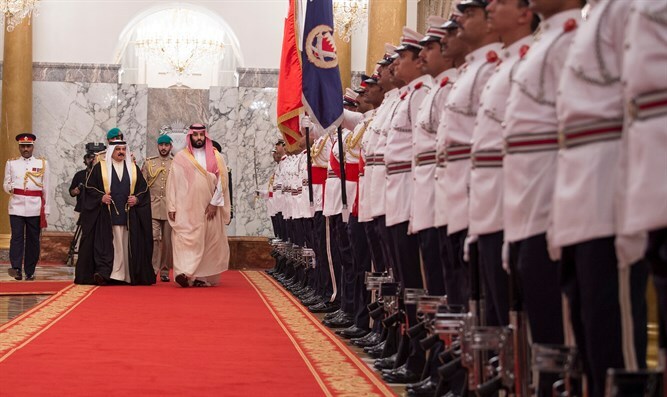 The Bahraini Foreign Minister’s comments follow recent reports that Israel is working to promote diplomatic relations with Bahrain, in light of the rapprochement with moderate Arab states, including Oman. Last month, a senior Israeli official told the press that Israel is in close talks to establish diplomatic relations with the Gulf state, amid reports that the Israeli government is in talks with several African nations in a bid to improve relations. On Thursday, the Middle East Eye reported that Crown Prince of Saudi Arabia, Mohammed bin Salman, is planning a “game-changing” meeting with Israeli Prime Minister Binyamin Netanyahu. According to the London-based, Qatari-funded outlet, the sources in the Saudi kingdom claimed that the Crown Prince is “seriously considering” a “game-changing” meeting with Netanyahu, which would be hosted by President Donald Trump. The plan for a meeting with the Israeli leader, including a public handshake modeled on the Begin-Sadat handshake at Camp David in 1978, is reportedly being developed by a special team put together by the Crown Prince to deflect criticism following the killing of dissident journalist Jamal Khashoggi at a Saudi consulate in Turkey in October. The move is reportedly being promoted in part in the hopes of curbing plans by Western powers, including a pending motion in the US Senate, against the Saudi leadership over Khashoggi’s murder.